“Am I getting too old for this?” I thought as the 5 AM alarm came too early. I was in Guatemala as a Rotarian and volunteer through Engineers Without Borders USA. We were moving at break-neck speed, hiking up and down steep mountains to evaluate 10 potential new projects. Yesterday, we’d done a half-day mountainous hike to test two newly discovered springs that might provide clean water to a community that had never had it. That got me moving, as did the fresh Guatemalan coffee. 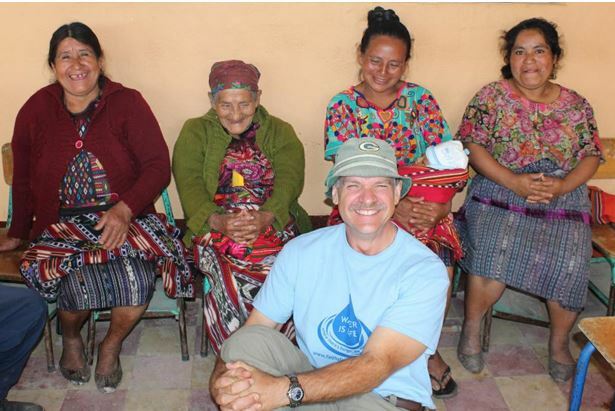 I was in a rural mountain village where a community named Chupoj, descendants of the ancient Mayans, had requested assistance with a potable water system for its 840 members. The Rotary Club of Milwaukee, along with other clubs in our District and the Vista Hermosa Rotary Club of Guatemala, want to partner on this project through a potential Rotary Global Grant. That morning I met with the community’s four healthcare providers who provide care to their community without benefit of the most basic foundation for health: clean water. During the dry season, water came from the dirty river, requiring a three-hour walk down a steep mountain path and back up with a 40-pound jerry can of water. When it came to childbirth, these four women needed to make sure they had ample water on hand. They would instruct a family to pray for rain as the mother got close to going into labor. If no rain came, family and neighbors would make about 20 trips to the river below to obtain water. 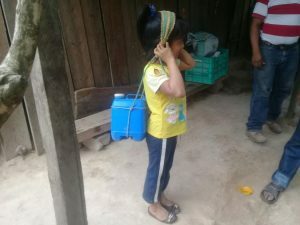 Even this little girl helped carry water in advance of the birth of her new sibling. Nearly every family had suffered the tragic loss of a child to waterborne diseases, including these four ladies. Quiet tears spilled down Donna Tomasa’s face as she told me how water had played a different but equally tragic role in the loss of her own baby. Tomasa was pregnant and helping carry water up the mountain for a pregnant woman near labor. Tired, she slipped and tumbled down the mountain. She lost her child. Then Donna Maria allowed her frustrations to spill out. How could they provide the quality care they knew, without the clean water they needed? The dirty river water caused infections, especially in babies and new mothers. They did their best, but it could never be good enough without clean water. It wasn’t that the community hadn’t tried to establish a reliable source of water. Five years ago, the community waited patiently as a drill rig was hired to bore 660’ into their mountain, but no water appeared. Working with the municipal government, last year a larger drill pushed 1000’ into the mountain. Again, no water. The community refused to give up. They searched the river valley and finally found two remote springs, which are what brought me to this mountain hamlet in rural Guatemala, sitting across from these four remarkable keepers of the community’s health. These ladies were delighted as I gave them the good news: yesterday’s water tests showed that the springs could provide clean water now and into the future. The community will need pumps and pipes to get the water up to the mountain. That’s why a Rotary Global Grant is needed. As I watched these four healthcare giants walk away, down a path lined by corn stalks towering above them, I knew this project was more than a good idea. It meant a better life.